Nestled amongst the Victorian and Federation buildings of Glebe Point is one of Sydney’s oldest temples built by Chinese immigrants from the Kwongtung region. The original groups of trustees purchased the land from the owner for £325 and built their temple two years later. It was funded by immigrants from the Sze Yup area in Kwongtung, China. Recognising the temple’s value, the National Trust classified it in 1975. The Sze Yup Temple is dedicated to Kwung Ti, a warrior and patriot in the era of the Three Kingdoms 220-265 AD. Kwung Ti is famous for his loyalty, physical prowess and masculinity. In Australia, the god was worshipped by immigrant Chinese as a wise judge, a guide and a protector. Many important business decisions, for example, were not made until Kwung Ti had been consulted for his guidance and blessing. 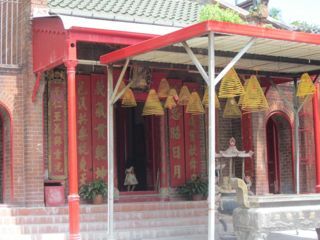 The central temple in the Sze Yup complex was built in 1898. The simple red-brick cottage was designed with the principles of feng shui in mind, favourably located on land which gently sloped from the temple to the waters of Rozelle Bay. For Sydney’s Chinese community the Sze Yup Temple was a cultural centre as well as a place for worship. Travellers and new migrants could find accommodation and material assistance here as well as social contact and companionship. Celebrations and festivities such as the colourful and lively Chinese New Year took place at the temple. It was also used to house the bones of the deceased before they were taken to China in urns for permanent burial, as tradition demanded. Keep (Kip) Fond is a well-known trustee of Sze Yup Temple and has written a history of it. His family has been associated with the temple for three generations. In 1978 the temple was restored following a fund-raising appeal. The newly renovated temple has a green tiled roof and a traditional Chinese architectural combination of red and green. In 1982 an archway was added to the temple complex with two stone lions guarding the huge entrance. In 1985 the temple was covered by a Permanent Conservation Order. It is now regarded as one of the most significant temples of its type in NSW and is listed on the State Heritage Register. The Sze Yup Temple can be seen on the Glebe’s Late Victorian Streetscapes Walk.